Tai chi demonstration was one of many exciting activities at the 4th annual Wellness Fair. Fitness, health and overall wellness were the words of the day as the Webster University community at the Webster Groves campus came together for the 4th annual Webster Wellness Fair on Sept. 16 in Grant Gymnasium. An estimated 200-250 students, faculty and staff participated in activities or gathered information from 37 on- and off-campus vendors who offered different perspectives on living a healthier life. Attendees explored booths that showed new ways to eat, live and be well. Every 15 minutes during the three-hour event, attendees qualified for attendance door prizes including: health sports bracelets, resistance bands, water infusers and much more. Of the attendance prize participants, seven percent were faculty, 38 percent were staff and 55 percent were students -- a great cross-section of Webster community members interested in wellness. Along with the variety of information, some booths offered interactive components and demonstrations. Activities included: jenga at the YMCA table, foursquare, stress relief coloring and spine analysis. 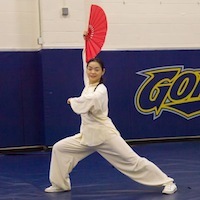 There was a tai chi performance and a self-defense demonstration by Public Safety. The vendors at the event promoted different wellness, health and fitness considerations. Some booths featured informational pamphlets, educational information and health product samples. A time-old college tradition also proved true: offer food, and they will come. Some of the most popular tables offered healthy snacks and smoothies. Special events coordinator Heather Arora operated the Webster Works Worldwide booth, reminding Webster students and staff to sign up for Webster Works Worldwide 21 on Oct. 7. Check out photos of the event at the Webster University Facebook Page. Interested students, faculty and staff can now keep up with Webster Wellness activities and information through their new Facebook page.